Dr Jacqui Webster, PhD, RPHNut, is an Associate Professor and Director of the World Health Organization Collaborating Centre on Population Salt Reduction at the George institute for Global Health. Her primary research interests are salt reduction strategies, working with the food industry to improve food and health and public health advocacy. Jacqui grew up on a farm in Yorkshire, England and has worked on food policy for over 20 years. Having studied Sociology at Durham University and completed her Masters in International Development at Leeds University, she then worked for a range of government and non-government organisations. 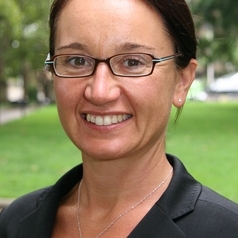 Jacqui completed her PhD on public health advocacy at the Sydney Medical School, University of Sydney. She is currently supported by a four year co-funded National Health and Medical Research Council/National Heart Foundation Career Development Fellowship. She is a frequent consultant to the World Health Organisation and has supported the development of salt reduction strategies in China, Mongolia, Vietnam, Cambodia, Laos and in the Pacific Islands.